The first Panoramic Survey Telescope and Rapid Response System telescope, Pan-STARRS 1, is now fully operational, tracking the sky for "killer" asteroids and comets. Pan-STARRS will survey the sky, hunting down asteroids that could pose a threat to the Earth. Image: David A. Aguilar. The 1.8 metre facility in Hawaii is deemed to be the front line of Earth defence, scanning the sky every night with the world's largest digital camera that boasts 1,400 megapixels. As well as asteroids and comets, the telescope will also catalogue supernovae, quasars and stars as it maps one-sixth of the sky every month. “PS1 has been taking science-quality data for six months, but now we are doing it dusk-to-dawn every night,” says Nick Kaiser of the University of Hawaii Institute for Astronomy, and principal investigator of the Pan-STARRS project. The Pan-STARRS 1 Observatory is located on Haleakala, Maui. Image: Rob Ratkowski. 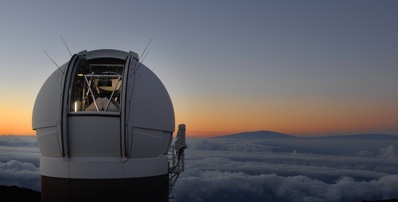 The camera will snap over 500 exposures each night, sending some four terabytes of data – equivalent to the data capacity of 1,000 DVDs – to the Maui High Performance Computing Center for analysis. There, the images will be quickly compared with those taken earlier that evening or week to determine if any objects have moved or changed in brightness. 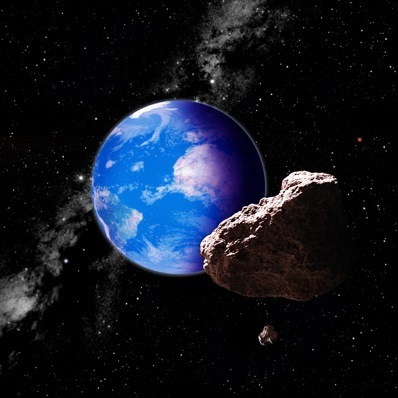 Pan-STARRS scientists predict that over the next three years, 100,000 new asteroids will be identified and analysed to determine if any are on a collision course with the Earth. Pan-STARRS is also expected to catalogue five billion stars and 500 million galaxies, along with a new population of trans-Neptunian objects and comets. “The system has the capability to detect planet-size bodies on the outer fringes of our Solar System,” comments Smithsonian astronomer Matthew Holman. “As soon as Pan-STARRS turned on, we felt like we were drinking from a fire hose!” adds Edo Berger from Harvard, who adds that Pan-STARRS is already finding several hundred transient objects a month, which would have taken a couple of years with previous facilities. PS1 is the prototype for the even greater PS4 telescope, which will have four times the power of PS1.